Your guide to Honolulu culture, local cuisine, nightlife, outdoor activities, and shopping. Chinatown in Honolulu is one of the oldest in the United States, so if you find yourself in Oahu this Chinese New Year, you’re in luck! 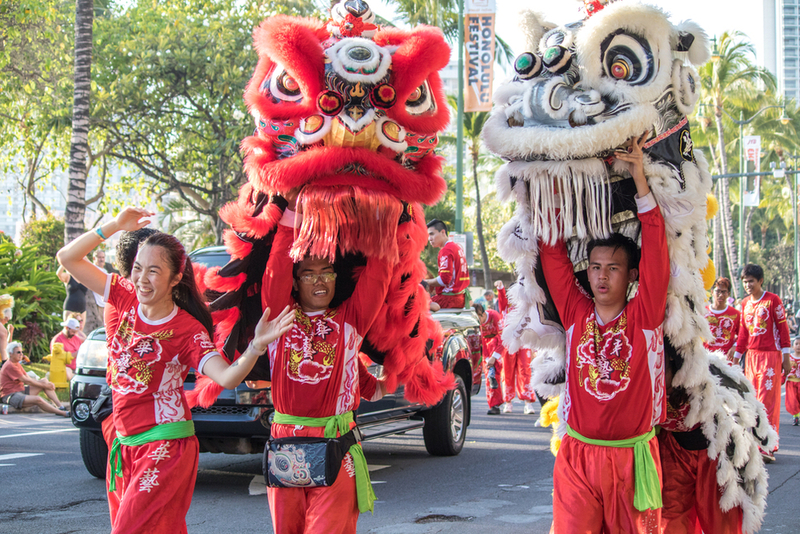 A parade, fireworks, lion dances, and traditional and modern Chinese fare will be available during the annual street festival in downtown Honolulu. Put on some red clothes for good fortune, bring along cash to enjoy street vendors, and set out to Chinatown, just 5 miles from Aston Waikiki Beach Hotel. To avoid traffic and parking issues, guests can opt for a taxi ride from the hotel or public transportation using The Bus. Take the #20 (Airport-AZ Memorial-Stadium-Pearlridge) from Kuhio and Paoakalani avenues up to Iwilei Road and Sumner Street, and you’re just a three-minute walk from all the action. See map. Here’s a look at the main events celebrating the Year of the Pig on Saturday, Feb. 2. The annual block party was on hiatus in 2018, but this year’s event is set to bring back the beloved traditions of celebrating the new lunar year. The party is expected to fill Smith, Maunakea and Pauahi streets with roughly 15,000 attendees. Arrive hungry and take your pick of Chinese foodstuffs from local vendors. Live music, martial arts demos, cultural education, and more is expected during the all-day affair. This area of Chinatown will be closed to traffic and open to pedestrians all day until 10pm. The colorful, lively parade will begin at the Hawaii State Capitol at 4:30pm, lasting an hour. Expect colorful garb, lion and dragon dancing, live music and, of course, fireworks. Gather a spot along Hotel Street; the parade starts at the intersections of Richard and Hotel streets and will run to Smith Street. Firecrackers are commonplace, so if you’re traveling with little ones, come prepared with ear plugs. Following the parade, the widely-hailed Sing Yung Dragon and Lion Dance Association 昇勇龍獅協會 will continue their performance at the Moongate Stage in the Chinatown Cultural Plaza. They’ll perform traditional lion dance routines and acrobatic pole jumping lion dances. Show starts at 8pm. If you haven’t yet booked your hotel stay, consider Aston Waikiki Beach Hotel, centrally-located to all the activity in Waikiki. With sweeping views of Kuhio Beach, it’s just walking distance from major shopping centers and offers excellent onsite amenities. Book a room with ocean views to enjoy stunning sunsets or of Diamond Head, an ancient volcanic crater and iconic symbol of Oahu. Check out exclusive offers only available on our website. We hope to see you soon!